The Regenstrief Institute is known for creating better pathways to wellness – and now their new headquarters in Indianapolis, IN creates a better pathway for medical professionals and healthcare students alike. With help from innovative TEC products, Schmidt Associates of Indianapolis designed the four-story, 80,000-square-foot building that will be home to the Regenstrief institute’s respected local, national and global research, housing 165 staff members and a large number of allied scientists. Challenge: Not long after construction began in October 2014, challenges started to arise within the floors of the building. Starnet contractor, Certified Floorcovering Services, Inc., discovered that more than 3,000 square feet of the concrete slab in the foyer and bathroom had a high relative humidity (RH) of 96. Solution: Moisture mitigation was the only way to solve the problem on the burnished, contaminated concrete, and TEC® moisture mitigation systems were the solution. Certified Floorcovering Services, Inc. used TEC® LiquiDam EZ™ moisture vapor barrier to moisture mitigate 3,000 square feet of the floors. Another 450 square feet were mitigated with the original TEC® LiquiDam™. Both formulas, which can be directly applied onto green concrete up to 100% RH and may not require shotblasting on clean, sound surfaces, helped achieve a high level of moisture control and allowed the contractors to quickly move on with the installation. TEC® LiquiDam EZ™, which launched January 2016, is the industry’s first single-component, liquid-based moisture vapor barrier. It protects flooring systems from damage caused by severe moisture and alkalinity, and can be hand stirred and then directly applied. The single-component formula dries in a quick 4-5 hours, allowing for same day flooring installation. Within the building, TEC® quality product solutions didn’t stop at moisture mitigation. 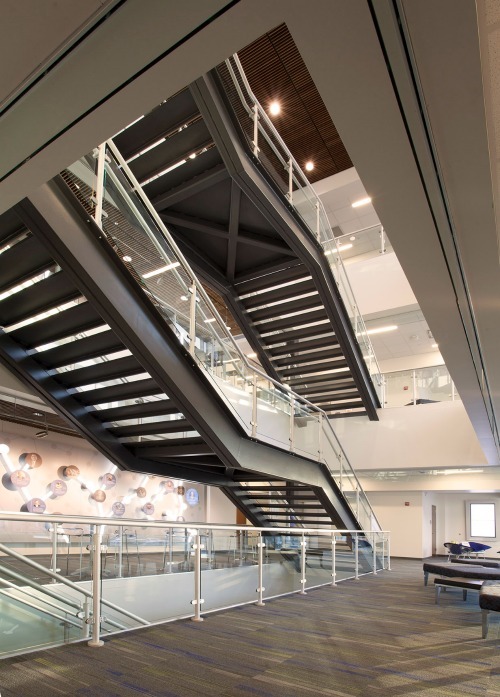 Four flights of steel stairs in the Regenstrief headquarters were covered in 12x24 large format tiles – a challenge since steel is a difficult-to-bond-to substrate for tile installations. TEC® Multipurpose Primer created a quick fix, directly bonding the tiles to 120 large steel stairs. TEC® Ultimate Large Tile Mortar was used for its non-slump and non-slip formula for heavy tile and stone applications. A total of 7,100 square feet of TEC® products were used throughout the headquarters in the hallways, bathrooms and stairwell. TEC® products used: LiquiDam EZ™, LiquiDam™, HydraFlex™ Waterproofing Crack Isolation Membrane, PerfectFinish™ Skimcoat, Ultimate Large Tile Mortar, and Power Grout DeLorean Gray. Contractor: Certified Floorcovering Services, Inc. Designer: Schmidt Associates of Indianapolis, IN. Construction started in October 2014 and was completed in November 2015.